Drop the words “artificial intelligence” into a conversation, especially outside of the tech space, and talk always seems to turn to the impending collapse of the world as we know it. That kind of hyperbole tends to dominate the general dialogue when it comes to AI and machine learning. And while efficiencies created by AI will lead to the automation and elimination of some positions, the technology has also spawned plentiful job opportunities. As The New York Times reported last year, there’s fierce competition in Silicon Valley for AI specialists as companies vie to integrate the technology into their services and products, from smartphones to self-driving cars. The private sector is on the prowl for these professionals—and they’ll often produce handsome salaries to bring them into the fold. Machine learning engineers, on average, rake in salaries of $125,00 to $175,000. And job outlook for this position is exceedingly bright. LinkedIn’s 2017 U.S. Emerging Jobs report ranked machine learning engineers as the job with the top growth potential for that year. Similarly, job sites like Indeed are reporting explosive growth in AI-related job postings. 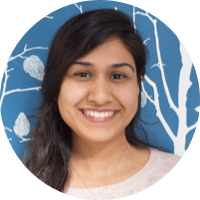 But while the job market for seekers is hot, machine learning engineers will still need a compelling machine learning resume to bag the right employer. Here are several pointers to ensure that your resume is in top shape before you send it to the next recruiter or hiring manager. 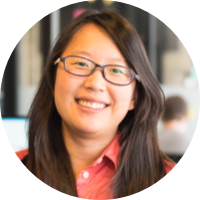 As a machine learning engineer, the format you choose for a resume won’t be as critical as if you were a graphic designer or creative director. As you build your machine learning engineer resume, you should generally include the following information. The fields are ranked by importance, but the order can be tweaked depending on your personal experience and preferences. Header: This is where you’ll state your name, address, and contact information. Personal summary: Typically around three to five sentences, a personal summary is a quick synopsis of who you are and what you’ve achieved. Using compelling storytelling, the summary is your opportunity to reel in the hiring manager. Show your personality and brag about your major successes. This is your opportunity to explain why you’re the perfect fit for the company. Experience: In this section, you’ll include all past relevant jobs you’ve had, along with a brief summary of your duties and accomplishments. Incorporate the time period for which you were employed. If you have less experience, feel free to include one or two internships that are pertinent to the job you’re applying for. Projects (optional): This field highlights and briefly summarizes applicable projects you’ve completed and that the prospective employer may find of interest. Skills (optional): This segment is where you’ll weave in skills and expertise that you weren’t able to incorporate in other sections of your resume. For example, in a machine learning engineer resume, you’ll likely want to include knowledge of scripting languages such as Python or Java. References (optional): Include the contact information of two or three people who know your work ethic and would be able to speak on your behalf. It’s critically important to ask these individuals for permission to list them as references on your resume before you send it out to prospective employers. It’s good etiquette, and if your references are caught off guard, it reflects poorly on you. Feel free to add or eliminate fields when your credentials warrant it. For instance, you can add a section completely devoted to honors and awards you’ve won or you could incorporate that information into your personal summary or experience sections. Below are a couple of resume examples to get your creativity flowing. 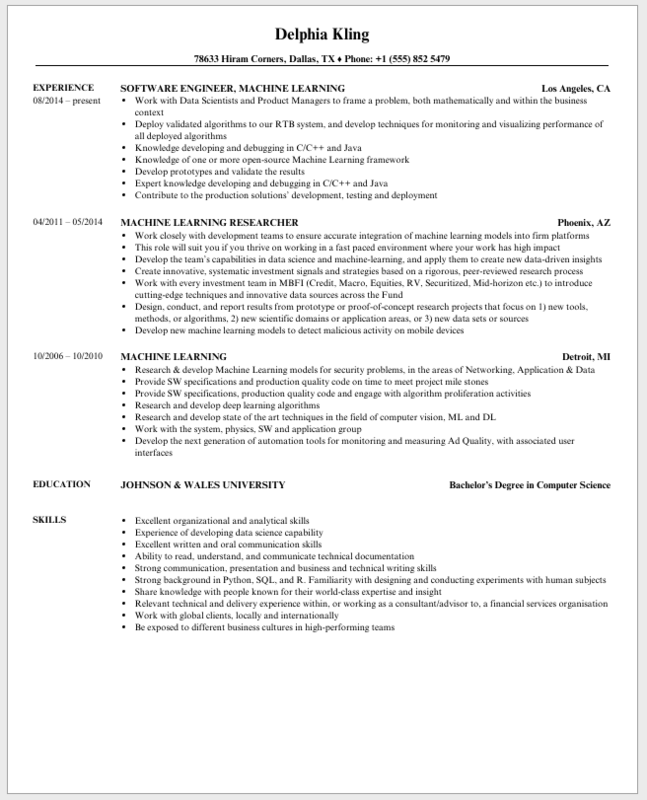 And here’s another example of a machine learning resume. The design is more creative and does a good job of showcasing the engineer’s skills. While it may be tempting to send a one-size-fits-all resume to each company, it’s important to individualize each resume to your potential employer’s specifications. Does a job posting ask that a candidate have specific programming knowledge, like expertise in Python? Bring that skill to the forefront in your resume. Have you completed a certification or course that specifically relates to a requirement listed in the job posting? Highlight it on your resume. Have you led a project that specifically relates to experience the employer asks for, like a Natural Language Processing (NLP) project? Add it to your resume. Is an employer seeking a candidate who comfortably fits with their social mission? Include a volunteer section on your resume and showcase your philanthropic side. Personalizing your resume to bring it in line with the job posting makes it easier for an employer to envision you working for them. Through an individualized resume, the hiring manager sees exactly how well you’d fit within the parameters of the job because you took care to showcase the exact skills they want in a candidate. Don’t be vague in your wording and assume they’ll be able to connect the dots. 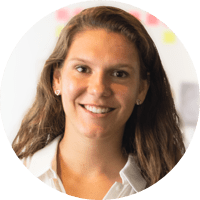 Clearly highlight how your skills relate to the company’s needs and the hiring manager will be able to visualize how you can fit into the organization. And if it’s obvious you didn’t customize your resume, there’s a decent chance that a hiring manager may not even consider it. It can be easy for our resumes to evolve into one large list detailing every responsibility we ever held in previous roles. But you shouldn’t just state your past workplace duties on your resume. It bores the reader, degrades your accomplishments, and doesn’t fully encapsulate how well you performed at your last job. Rather, highlight the victories and significant projects that you had a hand in. While your past day-to-day responsibilities are of some interest to an employer, companies are primarily concerned with what you can do for them. It’s important to showcase your past accomplishments and frame them in a light so a company can easily see how your performance would translate to your new role. Show the outcomes of those projects and accomplishments too. Don’t just state the project you’re proud of, demonstrate how your work positively impacted the organization. What kind of results did it yield? Did your work lead to a change in workplace processes? Use numbers and figures to get your point across. And if your projects won any awards or accolades, mention them. Resumes aren’t the place to be humble. Full understanding of common machine learning concepts; prior academic research in machine learning is also a plus (check out our list of machine learning blogs for some good places to start). Foundational knowledge of algorithms, statistics, and data processing. Past use of engines like Apache Spark. Bachelor’s degree in computer science, or a related field, or demonstrated knowledge of fundamental computer science concepts. Prior experience with GPU computing and data mining. Background in NLP and deep learning, and their corresponding tools and techniques. Analytical, critical thinkers and data-driven workers. Clear communicators who can easily translate complex information. Collaborative individuals who thrive in a team environment. Creative problem solvers and innovators. So, if you consider yourself a data-driven problem solver or have accrued any of the relevant experience listed above, be sure to articulate it in your resume. Again, it’s incredibly important to carefully review the job listing and adjust your resume accordingly. Don’t downplay your successes! If ever there’s a place to brag about your accomplishments, it’s on your resume. White space is your friend. Don’t feel the need to fill every square inch of your resume with text. White space brings a cleaner look to your document, making it much easier for the recipient to scan. Use the active voice. Avoid using the passive voice; it’s too wordy and can confuse the reader. Edit. Keep your writing concise. It’s always better to say more with less. Eliminate any flamboyant or superfluous verbiage. You probably don’t need it. Don’t feel confined to the one-page rule. If you have edited and edited but can’t seem to fit all of your resume into a one-page document, you may want to consider another option. (And we’re not talking about extending your document’s margins and decreasing the size of the font.) While the one-page mandate was once heralded as a golden rule of resumes, it’s no longer the norm. As Inc. points out, as long as you have enough relevant experience to justify some extra room, extending your resume an extra page is fine. Have a family member or trusted mentor look it over. Once you’ve dotted all the i’s and crossed the t’s, send your resume to a trusted friend, family member, or mentor. They’ll be able to spot glaring errors and give you an outside perspective on your finished product. You should also run the resume through a free editing tool like Grammarly to ensure there are no blatant grammar gaffes. 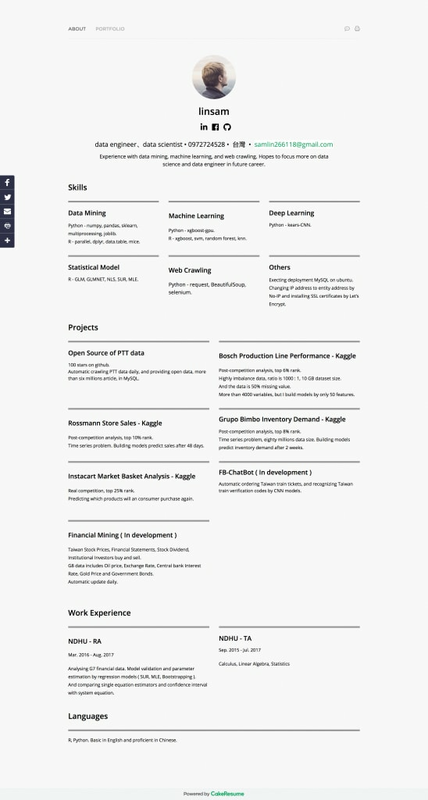 VelvetJobs offers samples of machine learning resumes that are helpful references. If you feel stumped over what to write on your resume, this may be a good resource to jumpstart your creativity. Microsoft offers several free resume templates you can download. Once you snag an interview with a prospective employer, make sure you read our blog post on machine learning interview questions so you’re extra prepared. 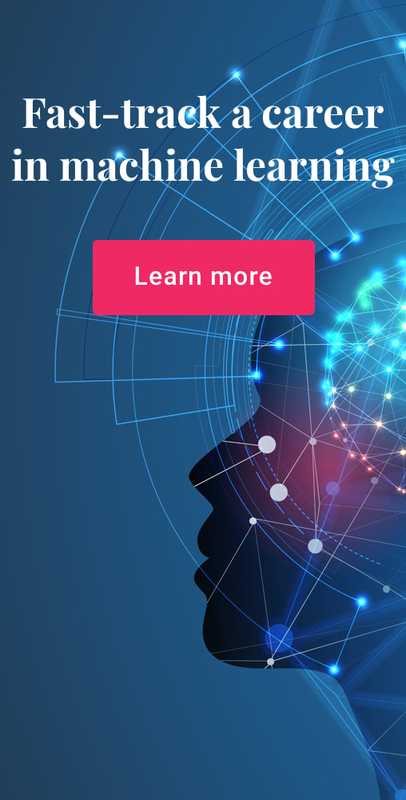 If you want more career-focused training, check out Springboard’s AI / Machine Learning Career Track, the first of its kind to come with a job guarantee. Melanie is a Milwaukee-based freelance writer. She has reported for publications like the Milwaukee Business Journal and the Wausau Daily Herald. Follow her on Twitter @mel_lawder.